It is time to get started with the first project. 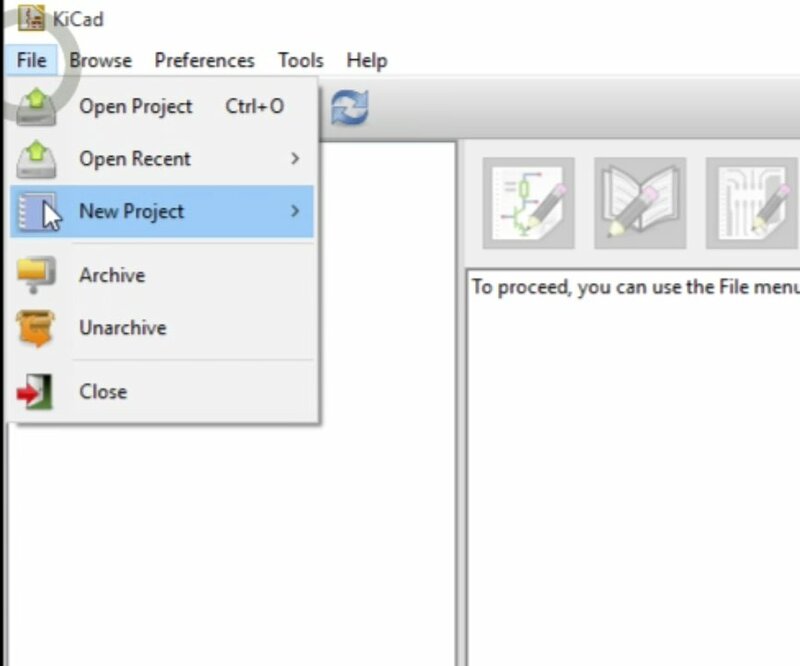 Start KiCad, then click on the File menu item and select New Project. 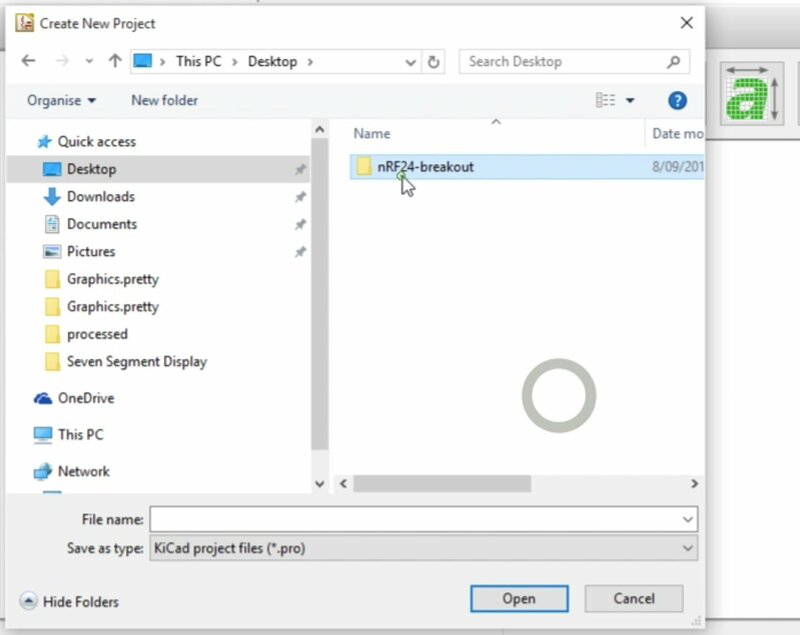 It is a good practice to store project files inside a project directory. 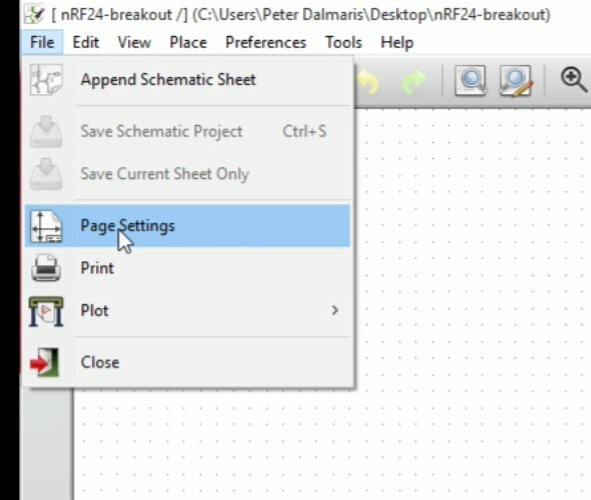 Create a new directory named nRF24-breakout. 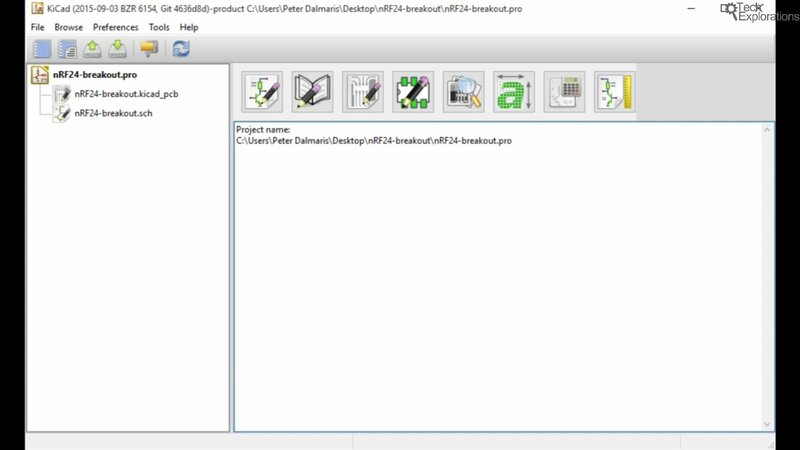 Then, go inside this new directory and create the project file, call it nRF24-breakout. Click on the Save button to finish the process. 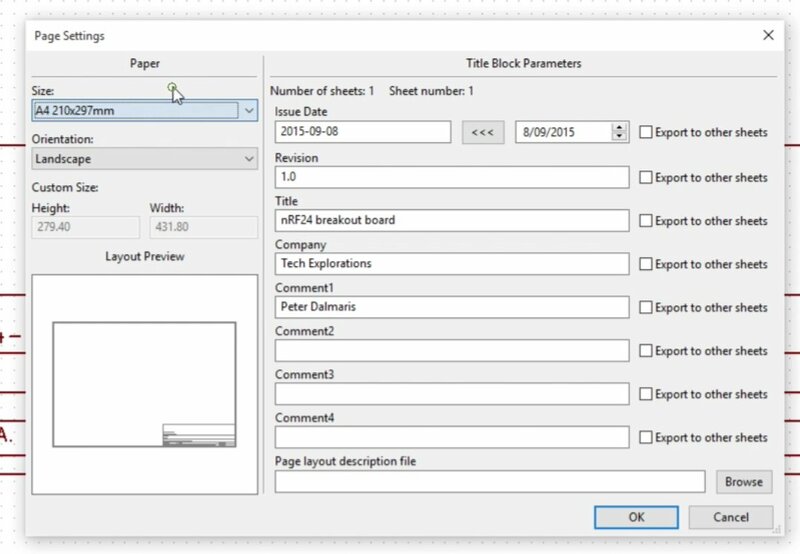 Once the Eeschema window appears, maximise it to gain as much screen real estate as possible. Components will be going into this canvas, which is the white area inside the red border, in the middle of the screen . Much of the work that you’ll be doing will be done via shortcuts and through the mouse. You can zoom in and out using the scroll wheel of the mouse. This is a basic function that you will be using constantly. If you’ve got a mouse without a scroll wheel, I strongly suggest you get one with a scroll wheel. I use a Logitech Bluetooth mouse, and it is very convenient. Another very useful feature is panning. Panning allows you to move around the canvas by clicking it’s left button while holding the command key on my keyboard (I am using a Macintosh keyboard with a Windows virtual machine, so the exact key combination may be different for you). Depending on the keyboard that you have, you may need to use a control or the shift key and that, again, it depends on whether you are on Windows, Mac or Linux. 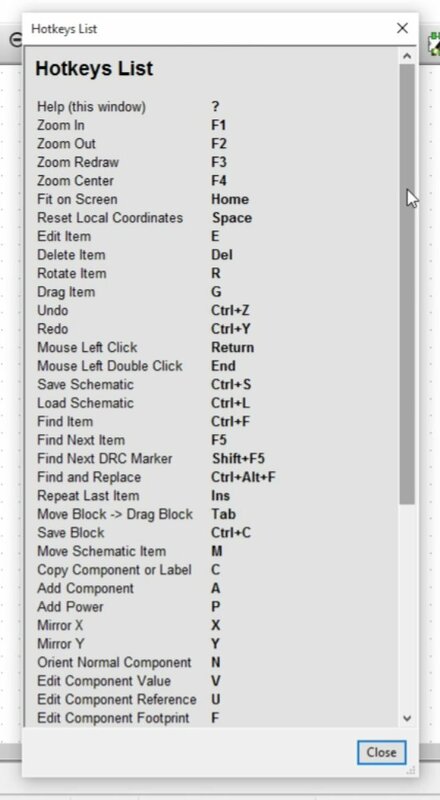 If you type Shift and the question mark then you’ll get the hotkeys list which contains all the most important and commonly used shortcuts. For example, by pressing the A key and you can add a new component. By pressing the P key you can add a particular kind of component: a power component. You can use the V key to edit a component value so it can set for example a resistor to its particular value and so on. There are a lot of hotkeys. We will not going to be using all of these in this project, but you can speed up your work by a lot if you can memorise only 4-5 of them. If you forget a particular shortcut, remember to type Shift and the question mark to bring up the hotkeys list. If you look carefully at the canvas you will notice small dots spread out throughout. These dots mark the grid. 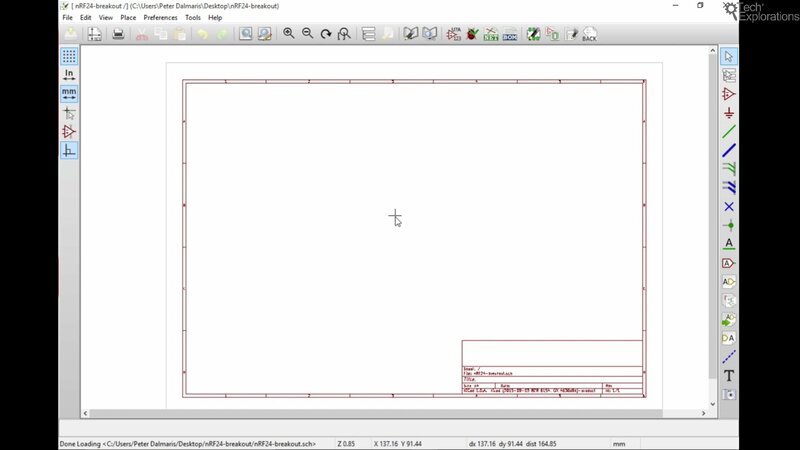 The grid allows you to align the schematic components in tidy rows and columns. You’ll be using the grid to make sure that everything aligns well. On the left side, you’ve got a few buttons so you can switch your distance units to inches or millimeters. I’ll be using millimeters in this book. You can change the cursor shape to cross hairs by clicking on the crosshairs button. I think that’s a little bit distracting so I prefer to have that off and just have a small cross in the middle. The “Show hidden pins” button allows you to show hidden pins, usually found in integrated circuit components. We’re not going to use this feature in this project but our next project will have integrated circuits with hidden pins, so we’ll be using this to turn them on and off. The last button allows you to draw wires and busses in any direction. The components, the wires, the busses, the labels and so on are available via the right tool toolbar. I’ll be showing you what these are as we go through. Finally, we have the main navigation and tools bar above the canvas. Through this bar you are able to do things such as zoom in and out, rotate a component, and redraw the canvas. 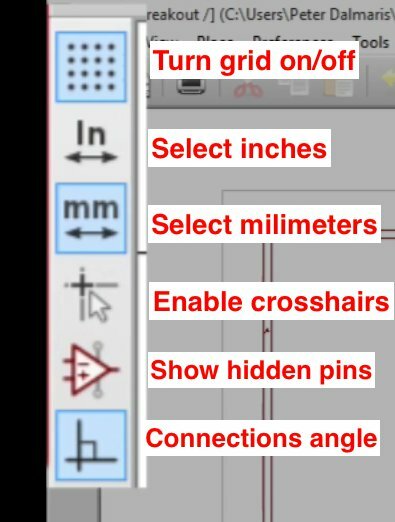 If you have somehow moved too far away from the part of the schematic that you’d like to be working on, you can click on the “Fit schematic” button (look for the button with a magnifying glass over two square brackets, towards the middle of the bar) to take you straight back to the centre of the view and the canvas, so then from here you can go back to your component. The next thing that I try to remember to always do is to set the page settings. 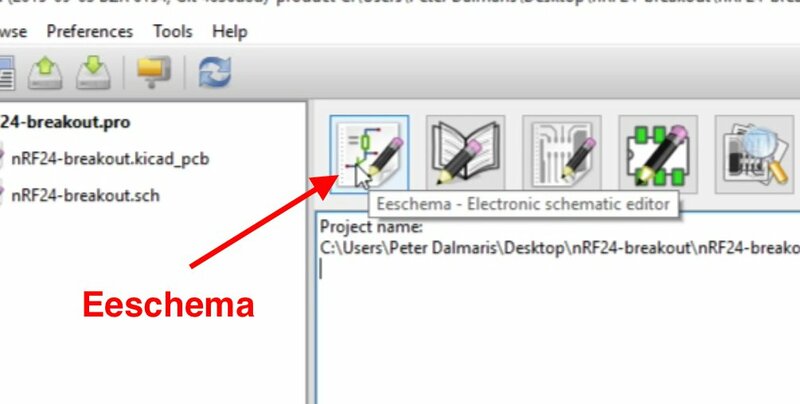 So what this does is to populate the text in the label down the bottom right corner of the schematic. So you can see that right now it’s empty and I’d like to put in the attributes of my schematic in here. And usually I forget to do this if I leave it for later so it’s the first thing that I do whenever I start a new project. Getting to the Page Settings window. Then, fill in the attributes as you see fit. To fill the issue date click on the button with the three arrows; this will copy the date from the calendar into the issue date field. For revision, since this is going to be our first revision, I’m just going to say 1.0, I give it a name, so this is an NRF24 Breakout Board, the name of your company. Fill in the rest as per the example in the image above. And you can see that all the details that I’ve just entered are now part of my schematic, the bottom right corner in the label.